Volume 5, Edition 1 Trouble loading? View this email online. 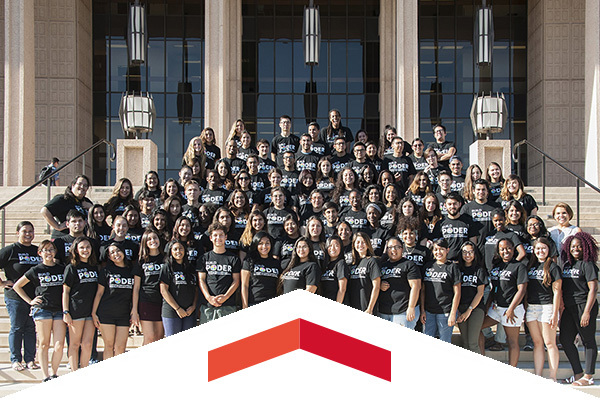 BUILD PODER, a program aiming to increase the number of traditionally underrepresented students in the biomedical fields by training undergraduates in biomedical research and providing financial support, has tripled in size and empowered students to better their communities in its first two years. 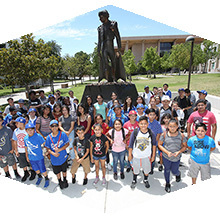 CSUN hosted more than 100 young people from the Dodgers RBI program, offering a tour of the campus and informational sessions to spur interest in pursuing a college education. 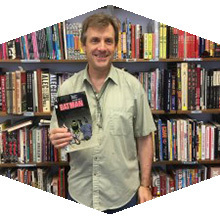 CSUN professor Charles Hatfield has enlisted Batman for the English 313 class he will teach this fall, “Studies in Popular Culture.” The class will explore the Dark Knight in all media — music, TV, games, toys — giving students the opportunity to critically analyze transmedia marketing. Thur, Aug. 17, 7:30 p.m.
See Emma Stone and Ryan Gosling perform City of Stars under the stars for this week’s AS Summer Movie Fest installment on the Oviatt Lawn. Sun, Aug. 20, 1 p.m. The road to a second straight Big West championship begins as the Matadors kick off their home opener against the visiting Tigers. The CSUN Art Galleries present part two of an exhibition featuring artwork by 30 full and part-time CSUN faculty in the Department of Art. This exhibition provides an opportunity to view contemporary work from artists active in their respective fields. The exhibit will be held at the Main Gallery until Sept. 23. Join HR and other campus colleagues in the HR Training Room, OV-16, or view online this CSU’s Got Talent Webcast featuring Karen Friedman presenting on Communicating Your Message for Maximum Impact. Join SRC management in the Oviatt Library Jack & Florence Ferman Presentation Room for insight into how they select the right students, introduce them to the customer service-focused culture of the SRC, and how they guide/mentor their students through their appointment. Additionally, Human Resources will introduce you to the Student Assistant Mentorship Program (StAMP) and show how you and your department can use it to help your student assistants be successful. This time of year can be exciting and yet hectic and stressful for both parents and children. This Employee Assistance Program webinar presented free to Faculty and Staff provides tips on balancing work and parenting, and a brief overview of issues facing today’s children. CSUN and Southwestern Law School have joined forces to bring a pilot clinic to campus for one year, starting in fall 2017. The clinic provides citizens and non-citizens pro bono legal assistance on immigration issues. Learn about CSUN taking home two awards at the 2017 California Higher Education Sustainability Conference and how professor Claude Wiley practices what he teaches in the latest edition of The Footprint. In a summer competition that featured 110 schools from all over the world, CSUN senior mechanical engineering students finished in the top 10, ahead of UC Berkeley, USC, UCLA and more. The next crop of students are already hard at work preparing for next summer’s SAE competition. Students and community members came together at the campus’ historic Orange Grove in July to pick oranges to donate to local food banks.